The true incidence of perinatal intracranial hemorrhage is not known. Clinical series do not identify the group of infants who do not present with clinical events, and autopsy series are biased toward infants with the worst outcomes. The larger autopsy-based studies report small subdural, subarachnoid, and intracerebral hemorrhages in 20-30% of live births. Larger intraventricular and posterior fossa hemorrhages were less common in these studies, representing 10-15% of live births. However, these studies represent older cohorts, and incidences have been declining. 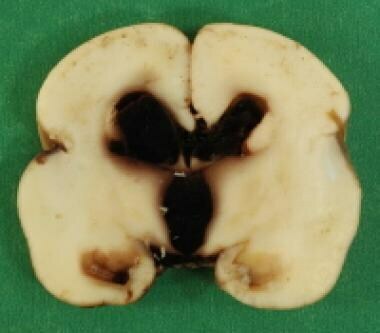 The following image is an example of a grade I germinal matrix hemorrhage. Gross appearance of grade I germinal matrix hemorrhage (GMH). The etiology of intracranial hemorrhage in infants varies according to the location of the hemorrhage and the gestational age of the infant. Furthermore, in many cases, more than one compartment may be involved. In preterm infants of less than 32 weeks' gestation, the most common source of intracranial hemorrhage is the germinal matrix. Supratentorially, the germinal matrix lines the lateral ventricles; thus, germinal matrix hemorrhage (GMH) may result in intraventricular hemorrhage (IVH), intraparenchymal hemorrhage, or both. Studies have identified many risk factors for the development of intracranial hemorrhage in preterm infants, such as low gestational age (LGA) and birth weight, maternal chorioamnionitis and other infections or inflammation, lack of antenatal steroid exposure, hypotension, hypoxemia, hypercapnia, pneumothorax, respiratory distress syndrome, and many others. [4, 5, 6] In all cases, however, GMH results from a combination of the intrinsic fragility of the germinal matrix vasculature, disturbances in cerebral blood flow, and coagulation disorders. The microvasculature of the germinal matrix is frail because of an abundance of neovascularization. These new vessels have few supporting pericytes, immature basal lamina, and deficient glial fibrillary acidic protein (GFAP) in the ensheathing astrocyte endfeet. High vascular endothelial growth factor (VEGF) and angiopoietin-2 levels activate rapid angiogenesis in the germinal matrix. The abundance of these growth factors may be ascribed to a relative hypoxia of the germinal matrix, perhaps resulting from high metabolic activity and oxygen consumption in the neural progenitor cells. The structural frailty of the microvasculature is easily susceptible to the significant hemodynamic changes that occur in the setting of perinatal hypoxia and predispose to GMH. It is thought that some genetic factors may contribute to the development of GMHs, although the associations are often inconsistent and unclear. 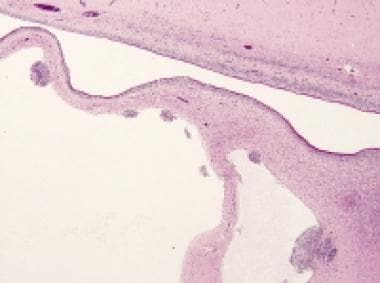 It is possible that conditions such as thrombophilia may occlude some germinal vasculature, thereby leading to vessel rupture or infarction. Research has shown that the incidence of GMH is higher in carriers of factor V or prothrombin G20210A gene mutations. Any underlying genetic coagulation disorder can also increase the risk of intracranial hemorrhage. Epidural hemorrhage is relatively rare in newborns, because the middle meningeal artery, the tearing of which is the usual cause of epidural hemorrhage, moves freely away from displacements of the skull in this age group. Subdural hemorrhages are more common and occur when vertical molding of the skull during labor causes tearing of the tentorial blood vessels. Subarachnoid hemorrhages are the most common type in term neonates and result from tearing of bridging blood vessels or dural sinuses during labor. Intraparenchymal hemorrhage is also relatively uncommon and may result from birth-related trauma, in association with a coagulopathy (see below) or from ischemia-reperfusion injury. In the cerebellum, precursor cells are found in the outer layer of the cerebellar cortex. Thus, preterm cerebellar hemorrhages are more superficial. Aside from perinatal risk factors, maternal risk factors (eg, drug use, pregnancy-induced hypertension, placental abruption, autoimmune disorders, and platelet alloimmunization) may contribute to the development of intracranial hemorrhages. Below, discussion of the clinical features and imaging of perinatal intracranial hemorrhages are divided into that for preterm infants and that for term infants. Most preterm neonates are diagnosed in the first day of life, and about 90% are diagnosed in the first 4 days. The traditional imaging modality for diagnosing GMH has been cranial ultrasonography because of its availability, low cost, and high resolution for bleeding. Doppler ultrasonography may be used to assess vascular flow; however, it is rarely used in a clinical setting, because its usefulness is unclear. Computed tomography (CT) scans are discouraged, because the effect of radiation on the immature central nervous system (CNS) is not known. Magnetic resonance imaging (MRI) can often detect petechial hemorrhages and smaller lesions; however, its use is limited by high cost, transportation issues, and concerns over sedation of the infant. GMH is graded according to severity, as shown in Table 1, below. The majority of neonates with intracranial hemorrhage have no clinical symptoms, including some with moderate to severe hemorrhages. Neonates who are clinically symptomatic may present with any of a number of neurologic symptoms, singly or in combination, including decreased level of consciousness, generalized hypotonia, and seizures. However, these manifestations are not specific to intracranial hemorrhage. Intracranial hemorrhages in full-term neonates are graded on the basis of severity, as summarized in Table 2, below. Among the conditions considered in the differential diagnosis of perinatal intracranial hemorrhages are herpes simplex virus infection, hypoxic-ischemic encephalopathy, and sinus venous thrombosis. In terms of gross appearance, epidural, subdural, and subarachnoid hemorrhages in infants are similar to those in older children and adults. The main caveat is that epidural hemorrhages (and skull fractures) may be missed in infants if the dura is not stripped from the skull. The gross appearance of germinal matrix hemorrhage (GMH) in preterm infants varies according to the severity (grade) of the hemorrhage. The hemorrhage may be confined to the germinal matrix (grade I) (see the first image below), or it may extend to the ventricles (grade II or III) (see the second image below) or the white matter (grade IV). 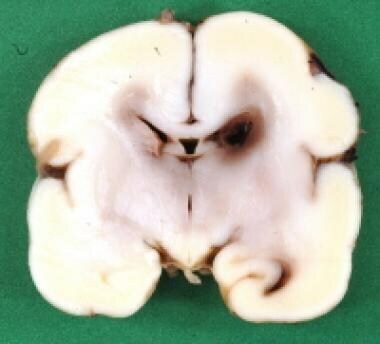 Gross appearance of grade III germinal matrix hemorrhage (GMH). Blood can be seen distending the lateral and third ventricles. In grade IV periventricular hemorrhagic infarctions, a large unilateral area of hemorrhagic necrosis can be seen dorsolateral to the lateral ventricle. In some cases, these are massive hemorrhages extending from frontal to occipital lobes. In these cases, the etiology is thought to be secondary venous infarction due to obstruction of terminal veins by the large intraventricular hemorrhage rather than direct extension of the GMH. Microscopic examination of the hemorrhage may help with dating, particularly in cases of subdural hemorrhage. Evidence of remote hemorrhage can be elicited with the help of iron stains, which may help highlight hemosiderin-laden macrophages. In some cases, small grade I GMHs (see the first image below) or cerebellar external granular layer hemorrhages (see the second image below) may be seen microscopically that were missed on gross examination. Furthermore, evidence of old GMHs may be found in the form of germinal matrix cysts lining the lateral ventricles (see the third image below). 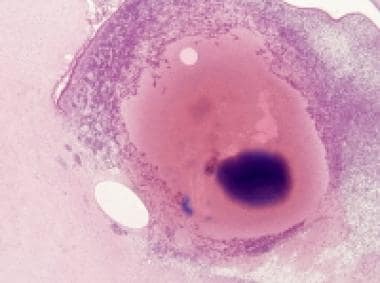 Microscopic appearance of grade I germinal matrix hemorrhage (GMH). Microscopic appearance of cerebellar external granular cell layer hemorrhages in preterm infant. 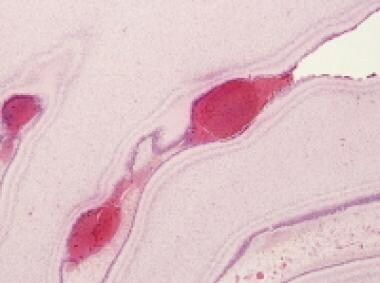 Microscopic appearance of germinal matrix cysts lining lateral ventricles. These findings are consistent with previous underlying germinal matrix hemorrhage (GMH). Infants with grade I and II hemorrhages generally recover well, but they are at baseline risk for major neurologic issues (relative to infants without hemorrhages). However, higher-grade bleeds are strongly associated with poor neurologic outcomes. Looney CB, Smith JK, Merck LH, Wolfe HM, Chescheir NC, Hamer RM, et al. Intracranial hemorrhage in asymptomatic neonates: prevalence on MR images and relationship to obstetric and neonatal risk factors. Radiology. 2007 Feb. 242(2):535-41. [Medline]. Gupta SN, Kechli AM, Kanamalla US. Intracranial hemorrhage in term newborns: management and outcomes. Pediatr Neurol. 2009 Jan. 40(1):1-12. [Medline]. McCrea HJ, Ment LR. The diagnosis, management, and postnatal prevention of intraventricular hemorrhage in the preterm neonate. Clin Perinatol. 2008 Dec. 35(4):777-92, vii. [Medline]. [Full Text]. Merhar SL, Tabangin ME, Meinzen-Derr J, Schibler KR. Grade and laterality of intraventricular haemorrhage to predict 18-22 month neurodevelopmental outcomes in extremely low birthweight infants. Acta Paediatr. 2012 Apr. 101(4):414-8. [Medline]. [Full Text]. Soraisham AS, Trevenen C, Wood S, Singhal N, Sauve R. Histological chorioamnionitis and neurodevelopmental outcome in preterm infants. J Perinatol. 2013 Jan. 33(1):70-5. [Medline]. Ballabh P. Intraventricular hemorrhage in premature infants: mechanism of disease. Pediatr Res. 2010 Jan. 67(1):1-8. [Medline]. [Full Text]. Bassan H. Intracranial hemorrhage in the preterm infant: understanding it, preventing it. Clin Perinatol. 2009 Dec. 36(4):737-62, v. [Medline]. Hefti MM, Trachtenberg FL, Haynes RL, Hassett C, Volpe JJ, Kinney HC. A Century of Germinal Matrix Intraventricular Hemorrhage in Autopsied Premature Infants: A Historical Account. Pediatr Dev Pathol. 2015 Sep 15. [Medline]. Radic JA, Vincer M, McNeely PD. Outcomes of intraventricular hemorrhage and posthemorrhagic hydrocephalus in a population-based cohort of very preterm infants born to residents of Nova Scotia from 1993 to 2010. J Neurosurg Pediatr. 2015 Jun. 15 (6):580-8. [Medline]. Radic JA, Vincer M, McNeely PD. Temporal trends of intraventricular hemorrhage of prematurity in Nova Scotia from 1993 to 2012. J Neurosurg Pediatr. 2015 Jun. 15 (6):573-9. [Medline].